As the UN launches new Sustainable Development Goals (SDGs) in 2015, the world’s leaders, businesses and research institutes are exploring how they can best contribute to the agenda. Science, technology and innovation have long been recognised as the basis for socioeconomic development and as core contributors to sustainable development. But are all aspects of sustainable development being addressed equally? Which countries are leading and where could research be developed? Are the papers having the impact needed to make a real difference? 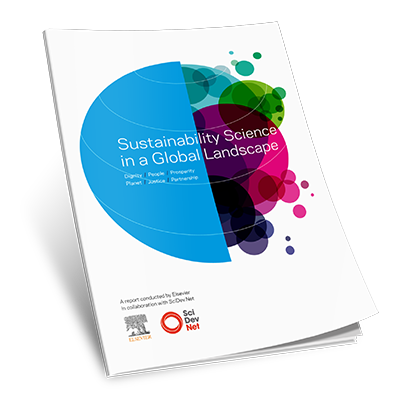 This report – a collaboration between Elsevier and SciDev.Net – examines the status of sustainability science as a research field. By looking at research output and citation impact, research collaboration and interdisciplinary research, this report contributes to our understanding of sustainable development, analysing how far sustainability science has progressed as a discipline. As such, it aims to support the dialogue between society and science under the UN SDGs and adds to our knowledge of sustainability science in the global landscape.